25 ohm loudspeaker loading resistors (snubbers). If your amplifier sounds better with a heavier (stiffer), less reactive load, here’s an easy plug and play solution for such matchups. Only one (1x) set is needed for a pair of Omen, they are packaged as a matched pair (one for the left loudspeaker, one for the right). Most amps sound best with Omen just they way they are, others have a sweet spot for a load of around eight ohms (8Ω), others around six ohms (6Ω) and some rare bests like to see a heavy four ohm (4Ω) loud. Which amp is yours? Hard to say, but these are priced so you can experiment for less then the price of a new LP. 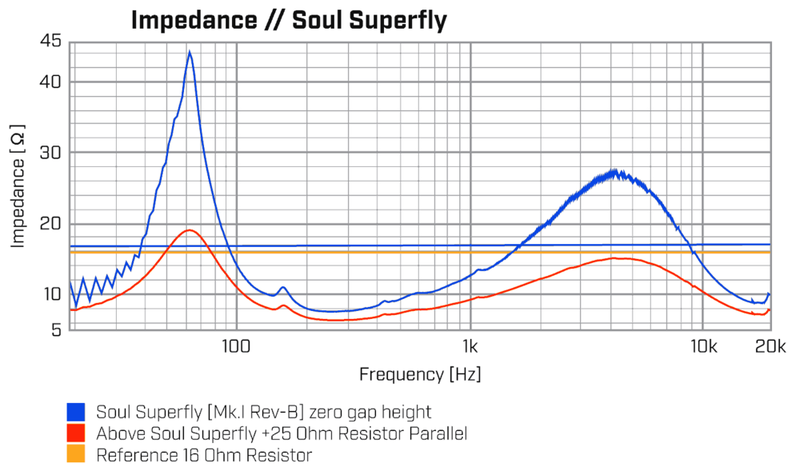 Also a factor in speaker/amp matchup is how an amp works with the electrical reactive swings within the loudspeaker. A purely resistive loudspeaker would have a flatline impedance curve—and 8 ohm speaker would measure 8 ohms at every frequency point throughout its bandwidth. To install simply unscrew the 5-way binding post, slide over the posts, screw the nuts back on. No tools, takes about a minute. Reduce the nominal Z-weighted impedance of Omen to about 8 ohms. See curves below. Reduces the z-weighted dynamic impedance ratio from 5:1 to 3:1. Matched tolerance is equal to or better than 0.5%.